My photo showed the spinnaker tack close to the bow fitting as that evidently provides greater performance, but I too put a knot higher up, so that visibility is improved (a bit). Sailing performance doesn't seem to have suffered. Closer to the bow shouldn't make a lot of difference so long as you still have adjustment available in the halyard. You will want the spinnaker luff tight for close reaching but you will want the spinnaker luff to be more rounded for running. 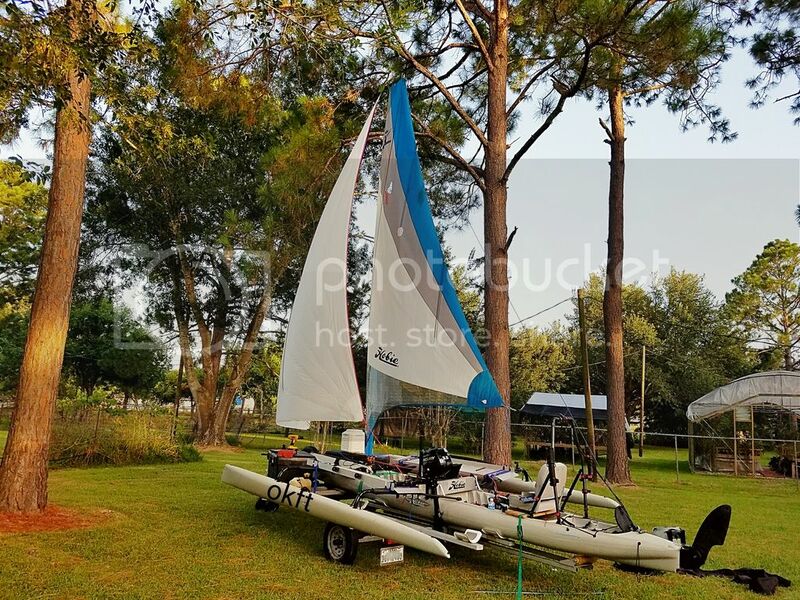 Unfortunately you need all the real estate from the tip of the bow to the back aka to stretch that spinnaker for a close reach. I only have about 3 inches to spare when thw foot is streched bow to aka. The knot may render the spinnaker of limited value upwind and i like to use it that way. I'll try it because I can imagine the downwind advantage. Greg, didn't you add some distance on your topper? Is that what's keeping you from a full hoist? If it is only the knots that are the issue, splice the line to the spin tack and head. Yah, PITA, I know. But you would gain a few inches. 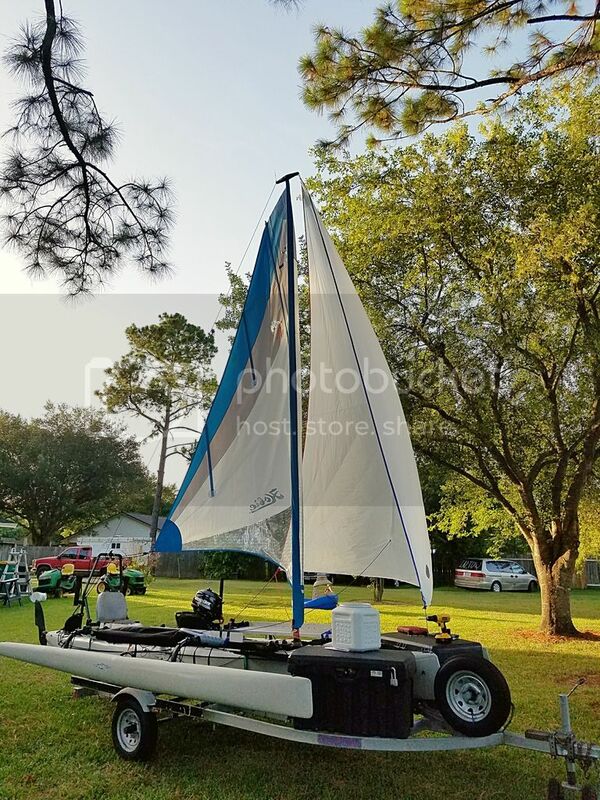 If the sail has grommets and they are small enough, you could just tie stoppers on the other side and achieve the same thing without having to splice. I did that once with my jib to get it further down onto the track, worked well. 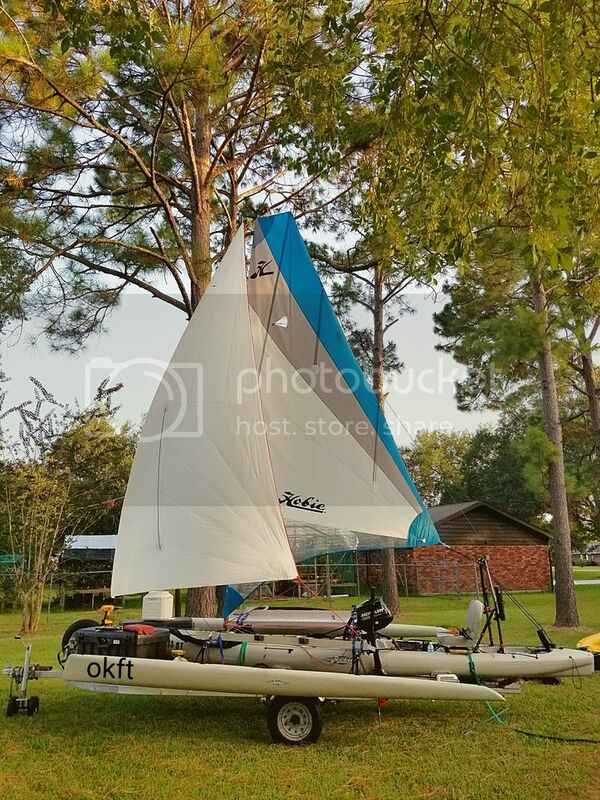 Here are some of my onland spinnaker deployed pics of the TI. Nice looking rig, all the right toys for max fun. Wait just one darn minute here, I just noticed where your motor is placed, nothing short of brilliant. We all know on the TI's the motors have to be mounted on the sides of the boat ( the boat has no stern), thats a given. The problem that comes up is all the weight is in the back with that thinking. Yea it's a given the motors have to be on the side, but nothing dictates where on the side that motor has to be. Where you have yours mounted is the strongest point on the boat, close to the center of balance of the boat. Better yet the props are very close to the turning rotation pivot point (center board). Just by moving the motors further forward on the hull solves a ton of issues with having the motors mounted in the way back. I always ride in the front seat, if I have to tilt the motors up or down or start them, I have to climb back there (pita). I had to add tiller extensions to control my throttles. My current dead man switches are a one time deal, basically if I tug on the kill line to kill the motor I have to climb back there to put the clip back on (another pita). That 3.5 motor you have is way more motor than my Honda 2.3, the main reason I added my second motor was the single motor couldn't provide enough propulsion (also for offshore safety reduncency). I'm keenly interested in your motor mount and would love to see pics and details. If your boat is setup like mine with safety lines those AKA arms that lock the AMA's out with the nylon sheer bolt, are not all that neccessary anymore. Never thought much about it before, but if my motor was down, and I had to release that arm in order to tilt the motor up, the safety lines prevent the AKA from folding, so if I pull the arm off to raise the motor, I can put the arm back on once the motor is tilted up, I could either put it back on, or leave it off, the safety lines prevent the AMA's from folding in either way. Not sure if I want my motors right up by my ears though, with them in the way back I can't hear them (I only ever run the motors at just above idle (very quiet with the underwater exhaust). But if it improves my situation, I'll get used to the noise. I have taken the "forward motor" concept even further, and have my outboard mount >on the haka< forward of the rear akas. I have a 3.5hp 2 stroke, so will be adding earplugs (good incentive to minimise motoring times! ), but it will be extremely convenient to have the controls close to hand. The pictures were taking with the provided instructions on the spinnaker. But now I use 2 harken ratchet blocks on the end of each ama. Salling is ok in the TI. 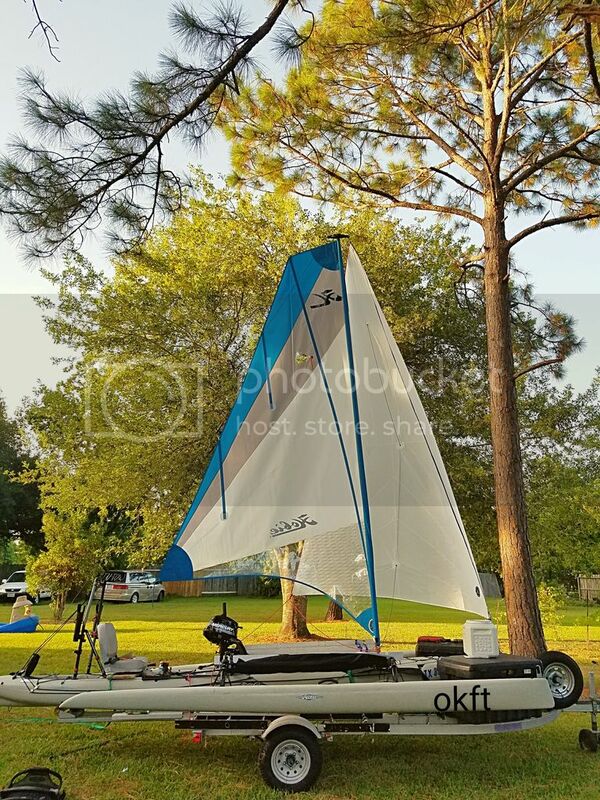 I just added the spinnaker for added safety as I do alot of offshore fishing. This is how I roll. So what i build must pass the ultimate test, the surf and back thru the surf. Wow, great video ! You guys are real pros ! Love it ! Congrats ! I will never grumble about my ramp launches ever again! That was hard work, and the soaking everything got was epic! Have you had any issues with the outboard being almost immersed? I try not to use the motor thru the surf as often. The outboard does get a little wet most of the time. I have added extra seals to the cowling and added an inline see thru fuel filter. My biggest issue that I'm having right now is, the ethenol fuel composition. This really starts eating away on everything that it comes in contact with. I usally keep on hand non ethenol unleaded gas and run a water seperator additive. Yea that ethanol gas just kills my Honda's, some of the local gas stations sell ethanol free 'recreational only fuel', big sign at the pump saying it's illegal to use in cars. I buy a five gallon can that usually lasts me around 6 months, The dealer I bought the motor from suggested I only use Yamaha fuel stabilizer (he said the normal stuff from Home depot wasn't very good), seems to work for me, most of my fuel related problems went away. I too have difficulty with my motors getting a soaking when it gets rough. Fortunately if they stalled by a wave, the air inlet is pointed down so the motor starves for air and quits, but the water doesn't seem to enter the engine (via the carb) The times it has happened I was able to restart the motor pretty quickly. The engines must be designed to take quite a dowsing. Probably 95% of the time when the motors go completely under in a wave, they stammer and struggle a bit ( you can clearly hear it) but they keep running, I have never had both quit at the same time. It seems to survive water rushing in the main cooling air intake ( around the flywheel) fairly well. I suspect the motors are carefully design to be able withstand an occasional wave going over, and the intake air filter system is designed with enough reserve air volume to withstand a few seconds immersion like from a wave. These TI's are really low in the water, the top of the motor is only 25" or so above the water. In 3ft chop (36") the motors go under all the time. That's just normal, like I said 95% of the time the motors don't die, and I have never had both quit at the same time. I started with the 2.3 honda, but had major issues with it. Saltwater and carburetors never mix. Had to replace it due the fuel jets clogged. Also the outboard uses a centrifical clutch system to engage the prop. All the components are noncoated steel parts. All the clutch components all rusted away. Also there is the main bearing where the prop shaft connects to the motor is steel. This caused my motor to lock up. I thought I had locked up the motor ifself till I tore it apart. That is where I discovered the seized bearing. I replaced the bearing with a sealed stainless steel one. After that massive tear down. I knew it was time to part from it. This made me unwary offshore. After I sold it, I did a lot of research on companies who took great lengths on protecting vital components on the engine. Mercury fit the bill. They were rated #1 in corrosion protection. The only down fall that i was going from a outboard that weighed 27 pounds to 37 pounds. If I placed it in the back it was going to squat the TI more underwater in rear. So I opted to place it on the left side away from main line and in the center of the TI. This way the person on the front or the rear can control the outboard. I think you are correct, I suspect I have just been lucky so far. Once thing I found out asking around down here in the Keys and So Florida, it appears on bigger outboards Yamaha reigns king down here in the Keys, followed closely by Merc and the Honda's are not very popular, for a lot of the same reasons you describe, most are pretty critical of the Hondas. Yamaha I don't think makes a small motor (not small and light enough for the Ti anyway). Isn't the small merc actually made by Tohatsu, and marketed by several brands (same exact motor), nothin wrong with that I guess as long as it works well. All the issues with the Honda carbs is totally related to ethanol fuel, all my problems went away with ethanol free fuel in my experience. Sorry I drifted off subject. Just a head's up, which is probably totally obvious to most of you, but if (while sailing on mainsail alone) you get the spinnaker halyard caught on the mainsail, and don't have anyone in the back seat (or you are not mobile enough to climb back there), just release the spinnaker halyard (after tying a figure eight knot in it to save totally re-threading it back on the beach. BTW, I have a snap shackle on my halyard to make it easier).Obviously, if your backstay is wrapped around the mast, don't bother with a knot, and just take all of the backstay/halyard down. Sure your spinnaker is out of action, but being able to furl the mainsail just might turn out to be much more important later in the trip.